I love acting because it allows me to explore the mind of another person. When I become a new character I am given the opportunity to explore parts of my own personality, some of which may be buried deep, as I delve into the character to ensure this character is unique, and not me. This is the fifth year I’ve played a Scottish pirate with our troupe, and each season I learn more about him, why he does what he does, says what does, how he thinks, his dreams and fears. I don’t always know what going to come out of his mouth, and he frequently surprises me. This keeps each performance fresh. 2.What made you want to do what you do? I started my acting career in third grade in a performance of Shakespeare’s Richard III. Once I got to high school I had a chance to be in shows again and have continue on since (with a several years gap while we raised some kids). Once I got the bug, I’ve never been able to shake it. The camaraderie that comes from working with an ensemble of other actors and crew creates an intense bonding experience unlike anything else I’ve done. 3.What is “full-bodied” about creativity? In other words, how would you connect what you do with writing and other creative processes? I also write, so I use my acting training and experience when I build new characters. I love creating the backstory that explains the flaws, dreams, and wants of the characters. Maybe I spend too much time doing that, but those characters live and breathe for me on the laptop screen. When I create a character, I look at what I would do if I were to play that character on stage: how would I move and speak, how would I create the make-up for that character, what costume would I choose, etc. It’s helpful to move and to speak like the character so I can describe that on the page. Hopefully, that gives my characters a three-dimensionality that readers can identify with. 4.What’s a book you’ve read—recently or a long time ago–that delighted you? Just one? My all-time favourite book is Margaret Craven’s I Heard the Owl Call My Name. Others that are at the top of the list are William Goldman’s Princess Bride, and Frank Herbert’s Dune. I’ve read all of these multiple times and they never lose their appeal. a healing massage by Rene Pinkham, LMP, or a choice of massage or wellness consult with Dr. James Drake, LMP, ND. We have only two spots left. The final discount code is SPRINGSPCL and gives you $70 off. The retreat takes place on Hood Canal in Western Washington. Transportation from the airport can be arranged. 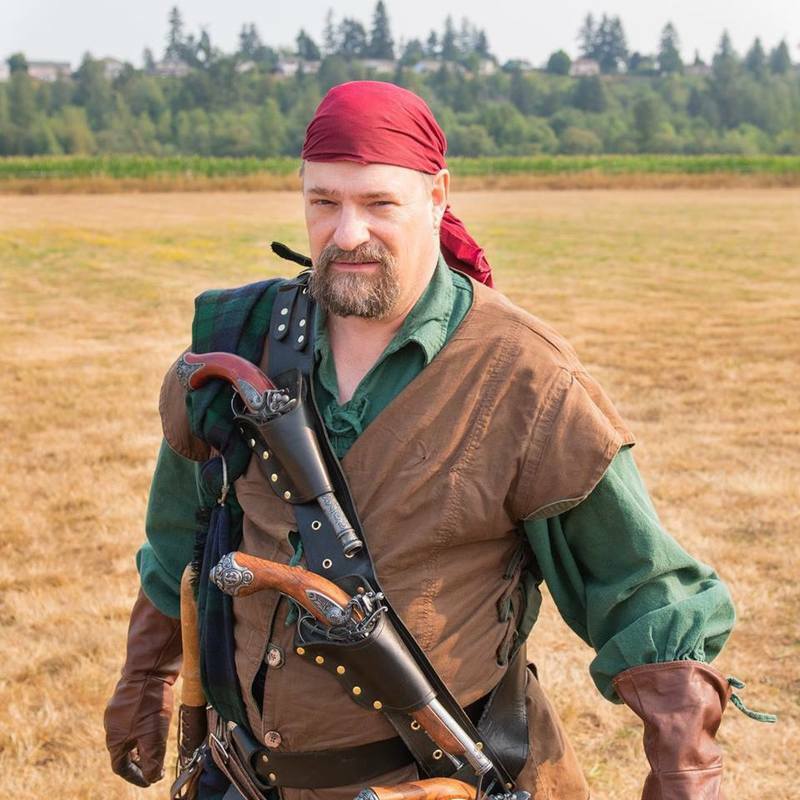 Andrew Bond brings us his experience of stage acting and historical reenactment with the Brotherhood of Oceanic Mercenaries (B.O.O.M) performing at Renaissance Faires and pirate festivals up and down the West Coast. Also a writer, Andrew looks forward to showing you how body position, movement, and voice affect the psychology of characterization, whether on the boards or on the page.